Carlos Morales, bicycle and pedestrian coordinator for the City of Omaha, Neb. Use the following suggested steps to make the most out of your participation in the Bicycle Friendly Community℠ program. New and returning applicants can find detailed information on how to apply below. Review the FAQ page and its resources. Reach out to local bicycle advocates and create an application taskforce. Create an account in our application portal. Gather required data, seek to form partnerships with schools, the police, health groups and businesses. Check if anything listed in the application could be implemented before the application is submitted. Reach out to local businesses and institutions of higher education (if applicable) to apply to the Bicycle Friendly Business and Bicycle Friendly University program. Contact the Bicycle Friendly America team at BFA@bikeleague.org if you need assistance in filling out the application or if you have questions. Submit the application on or before the deadline of August 8, 2019. After the deadline, look for a public survey from the League seeking local input from bicyclists in your community. Help distribute this survey link to residents and businesses. Share the report card with your local bicycle advocates and partners, prioritize the recommendations and start implementing. Gather required data, seek to form partnerships with local officials, schools, the police, health groups and businesses. If awarded, work with the local government and partners to prepare a press release and organize an award ceremony to celebrate your achievement. Share the report card with your local government and community partners, prioritize the recommendations and start implementing. 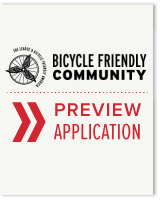 Review the Bicycle Friendly Community landing page and FAQ to learn about any changes that might have been made to the program since your community last applied. Create a new account. Our application system was updated in April 2016, every returning applicant will need to create a new account in order to re-apply. 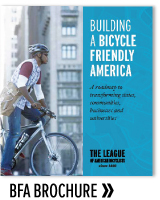 Please contact the Bicycle Friendly America team at BFA@bikeleague.org to request a PDF copy of your previous application, if needed. If your community’s designation is renewed or improved, prepare a press release and organize an award ceremony to celebrate your achievement. Share the community's updated BFC report card with your local bicycle advocates and partners, prioritize the recommendations and start implementing. There are two application cycles a year – one in spring and one in fall. A new cycle usually begins the day after an application cycle closes, so applicants have several months to fill out the online application. After a brief review of the general community profile, the applicant will continue to the reporting portion of the application, which asks questions about the community’s engineering, education, encouragement, enforcement and evaluation efforts. We refer to these sections as the Five E's. Most questions are multiple choice. This comprehensive questionnaire is designed to yield a holistic picture of an applicant community's work to promote bicycling. Following the BFC deadline, the League distributes public surveys to community residents, League members, bike advocates, and bicyclists who may be familiar with each applicant community. The League will send the survey to all local and statewide bike advocates identified on the BFC application, or who are organizational members of the League. Local advocacy organizations are encouraged to complete the survey and to distribute it to their members or local networks. All current members of the League who share a zipcode prefix with the applicant community will receive the survey link directly from the League via email. To update your mailing address or League membership status, click here. In the past, the League used a voluntary "Local Reviewer" sign up process to seek local input on BFC applications. We moved to this new method of involving communities, local bike advocates, and current League members in the distribution of the local reviewer survey in 2016, and have seen a great increase in participation as a result. In 2016 we also changed the local review survey to align with questions from the 2012 NHTSA Attitudes and Behaviors survey so that our local review process can give us, and applicant communities, an understanding of how their community compares to a nationally representative sample of citizens. You can find an example of how we provided survey results from the over 12,000 people who completed in 2016 on our blog. The BFC public survey is open to anyone familiar with bicycling conditions in the community, including those involved in submitting the BFC application. Applicant communities will not be judged on the number of responses received, and public input received does not determine a community's BFC award level. The public survey is meant to provide local context and perspective for the BFC review team's decision-making process, and is used in combination with the online BFC application submitted by the community. Anonymous aggregate survey results are included in each community's feedback materials following awards announcements. Point criteria are automatically applied to most data submitted by an applicant. These criteria determine the majority of each community’s category scores. League staff retrieves census data on the number of estimated bicycle commuters and the percentage of commuters who bike to work. Certain data is separated and run through separate point formulas. This is done where our criteria depends upon some relative measure that is produced by comparing different data provided by a community or census data. Data is checked for inconsistencies and adjusted if necessary. An optional public survey link is sent to all communities to be distributed by the community. This link is also sent to any bicycle and pedestrian advocates that a community identified and provided contact information for in its application. The League of American Bicyclists sends an additional survey that provides space for open-ended responses to bicycle and pedestrian advocates that a community identified and provided contact information for and bicycle and pedestrian advocates who are organizational members of the League. These surveys are typically distributed within 2 weeks of the closing of a deadline and are open for about a month. If necessary, review of public and advocate surveys or direct outreach to local advocates. BFC awards are recognized for 4 years. BFCs that last received an award in Fall 2015 must apply by the deadline above.